Chelsea! It's about time. Last Saturday, FL and I went down to see Myra's work in the photography show at New Century. I made sure I had enough time to do a photowalk, because this area is untouched photoblogwise. And right at the very beginning, on the corner of 26th Street and Tenth Avenue, was this gorgeous gas station (photoblogwise). Somehow I feel like I'm in a British crime novel. "Furtively glancing about, she quickly slipped the locket into her purse and silently exited." This part of midtown is very familiar to me since our office used to be on 47th Street and Second Avenue. Our office was also at Third Avenue between 42nd and 41st. Also at 42nd and Fifth Avenue. Now we're at Park Avenue South between 31st and 32nd. We may be gypsy lawyers but we stick close by Grand Central. We're circling it, actually. To get back to the subject, there was a Hallmark Card Shop on the corner of 44th and Third Ave. where I have bought many a card, and now it's empty. And in these photographs, I'm standing in front of the empty store and shooting through the window. Inside, the store is completely empty, but there are several square columns covered on all sides with mirrors. So we are seeing 1) the inside of the store, 2) the outside as reflected from the mirrors and 3) the outside as reflected by the window. These photos don't look like much until you enlarge them. I deliberately left them supersized in the enlargement. Lacking inspiration at ground level, I tried looking up. Last Tuesday I needed side prong track lights and new photographs. I took the subway to Grand Central (yes, one stop, what of it? 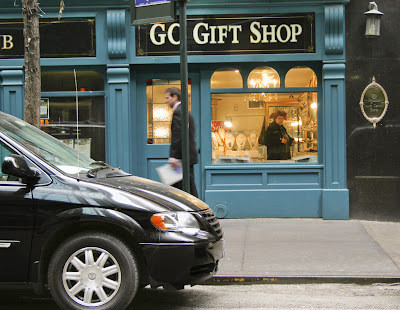 ), emerged on the Lexington Avenue side and walked to 45th Street. This is lunchtime on a cold day in midtown. Computer trouble struck last night, no internet access. Finally back online this morning after a mere hour on the phone and what a relief that is. Here's the photo I was going to post last night. I'll do another tonight. You know it's cold when the markets put plastic up to protect their outdoor produce bins. This was that frigid day a week ago Wednesday and by now, after about a half hour, I'm pretty cold, especially fingers, and ready to stop. Time for some coffee at the Broadway Cafe across the street. Back on Broadway now (last Wednesday, 1/17) and I come upon this unexpectedly frothy scene. Unexpected because, after all, it's cold, it's winter, froth is for lighter-hearted times, spring and summer. Not complaining. However, as I look at it in the size it appears on the blog, I see that it doesn't look like much, hardly even frothy. So please enlarge. This is one of a group of row houses just down the block from the Red House, and these row houses are singled out by Francis Morrone, whom you met last night if you were interested in magic. Look for the second to last paragraph. Last night's dogs are all the street action you're going to get on this walk. Remember it was about 21° at this point. On I forged. This building caught my eye, not only for its distinctive design, but (of course) for the V shaped U in its name. I checked it out on the web, and ran into two conflicting opinions about that particular block, one writer calling it rather ordinary and the other magical. My opinion lies somewhere in between. It's a fine block, I think. But later, in warmer weather and with more knowledge, I may go back to discover the magic. I take photos of city dogs now and again, but never post them. But this one has a certain Upper West Side look to it, a certain 86th and West End look to it, don't you think? (And so CUTE.) No! I didn't say that. This is but a small section of the Church of St. Paul and St. Andrews United Methodist, which is an impressive, handsome building with a tall tower. But it's a pretty section, no? An urban wintry landscape. Last Wednesday, my day off, I finally got out on a photo walk after seeing my therapist on West 86th Street. Pretty cold, I'd say, low 20's, and sunny. Luckily, the wind hadn't started up yet. I didn't stray far from a subway stop in case I began to freeze solid, only walked 86th west to Riverside and back on 85th. This shot is at the beginning of the walk, between Amsterdam and Broadway. Seeing the primary colors always pleases me and I'm attracted to the visual stacking of cars and colors. That's a CVS store with the red windows on the gray building. The things we do every day, unquestioningly. Go down these stairs? Well, okay. If that's the only way to get to the street. I guess we've all felt like this from time to time, riding the subways. Important Note: Do not be afraid to enlarge. By messing around with html, I got it so it will enlarge, not full screen as I would like, but still significantly bigger. Twice, both ways. I may not be able to post a photograph tonight. Every photo I upload shows up with the code that forecasts its disappearance overnight. This includes photos I've previously uploaded that were fine. So it seems to be when I do it rather than which photograph. I'm not giving up! I'm going to learn Html and be the master of my blog. First I'm going to find out what html stands for. Now, on the other side of the platform, some life! Some color! I look forward to being street level with this cute block. Notice the graffiti on the pipe on the roof. If you click on the photos now, they over-enlarge and run off the page, but at least you can see the tiniest details, including that pipe. I'm standing on the downtown platform at the Dyckman Street No. 1 subway stop, looking east, across to the uptown platform. Probably wouldn't have taken this shot in the summer. I HAD to get out today to photograph because I had nothing current to post tonight. This has happened only once before – on New Year's Day when I set it up on purpose. Devoted readers may remember that it rained on New Year's Day, and I stayed home and pulled up a photo from the archives. And so rain was predicted today as well, but it seemed to be an on and off kind of thing and I thought I would make it between raindrops. Wrongly. So I took a subway ride, got a few shots inside and a few outside on the covered elevated platforms. This first one is looking east out the window of the No 1 train between 215th and Dyckman. I would love to paint from this photograph. Sometimes I really miss painting. When I photographed this, I remember thinking about its abstract qualities (see photo below) and the battered structure itself. I do not remember thinking: what the heck is this? It sits at the bottom of the fearsome stairs at 187th Street. It has its own address: 218 (which, by the way, is not acknowledged in Mapquest). But what is it? I have to wonder at myself photographing this thing and only thinking about its appearance. Note to self: engage brain. In other unpleasant news, Blogger is letting us down. Photos posted last night disappeared this morning. After I post this (hoping they don't disappear), I'm going to reload last night's photos a different way and see if that works. As soon as I get a spare minute, I will look into a different web host. Apologies for the incoherent posting last night. Blame it on that last glass of wine. And now (completely sober and mercifully brief), continuing down Overlook Terrace, getting closer to 187th Street. It is 11:24 p.m. and I just got home and I would really like to be able to tell you which web site to go to to tell you if there is more or less and how much more or less construction there is going on in New York right now. But a quick look on the web doesn't come up with that information. So. Let me just say that it seems as if there is a whole lot of construction going on right now, but I don't know if that's because there really is, or it's because I'm out and looking. Maybe more solid information another time. The final resting place of Saint Frances Xavier Cabrini is located at 701 Fort Washington Avenue, New York. She is underneath an alter canonized as the First United States citizen Saint. The glass enclosed around her allows us to see her frail body often talked about when describing her. We can see her actual body? Maybe I'm too easily surprised. For some information about her, see here, and then click on History and Background. Last Wednesday, my day off, was catfood day, which meant Washington Heights photos. I took the A train to the 190th Street stop, which actually lets you out a couple of blocks north of 190, just outside the Cloisters' grounds where you have a bit of a walk before you reach the building. This shot is just outside the subway stop on Fort Washington. It was a bright chilly afternoon and apparently time for school to be out. This is the last photo from my January 2 walk back to the office. So holiday looking! For some reason, my pre-Christmas walks didn't lead to any shots like this. The lights stay up a long time here, just like everywhere, I guess, but I'm going to eschew all such shots henceforth. This is it. I'm trying to figure out why this shot doesn't bother me whereas this one did. In the earlier one, I loved the colors and different elements in it: the doorway with light and stairs and the red brick second storey and the dark red free daily box, but it seemed to be too much a photograph about a restaurant. In the present one, many of the same elements are present, the store front with the prominent sign, the doorway to the side and the brick second storey, but I don't get the same feeling, that it's a photograph about the restaurant. But why? What's the difference? The tree? I almost think that's it. I'd love to hear your thoughts about this. This is not in a meadow or swamp; it's at the corner of Second Avenue and 39th Street and I'm looking up into some grasses planted at the top of a brick wall about five feet high. Notice the blurry apartment building through the grasses at the right. This caught my eye because it is named Aquamarine, and yet, it is not aquamarine (bluish-green). Nor is it in any way evocative of water. It would be pretty to think that this is an homage to Jasper Johns who famously painted an area of color, say, red, and stenciled over it the word for a different color, say, blue. But farfetched. 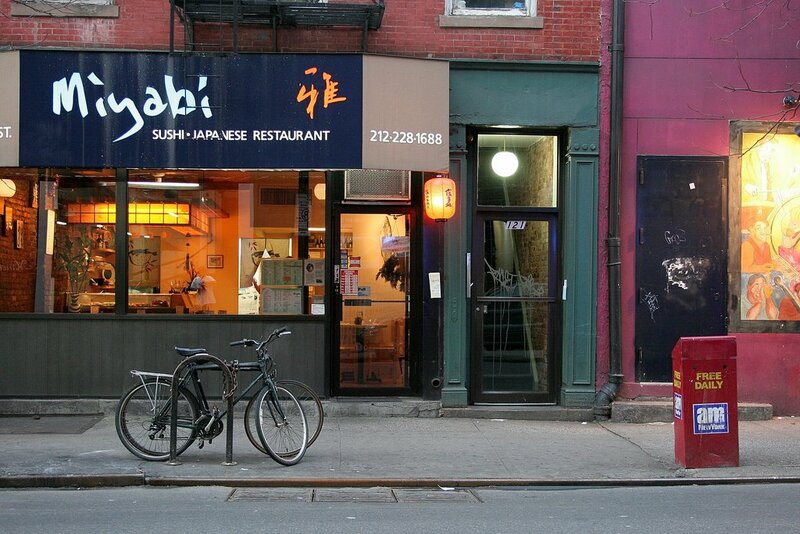 I discovered online that this is a Japanese sushi restaurant which gets mixed reviews, e.g., lovely music v. ear drum breaking music, lovely ambience v. tries too hard to be hip. The food seems to be "okay", "not bad". Okay, a rare, no, a unique event: a photograph I shot today. It only happened because I got it into my head that the January 1 shot had to be shot that day so it would be dated 2007. Of course, it wasn't, but I'm not going into that again; if you care, you'll have to page down and read the previous two entries. Today I had to dash over to the dermatologist to show him a mole that had ominously changed. You know what that means, folks, if you ever heed health warnings which I most certainly do. So he takes a look and tells me it was most likely bruised and not to worry. Just one more thing not to worry about. His office is on 37th between Second and First Avenues, kind of out of the way, so afterwards, I walked up Second Avenue to 42nd Street before I went back to work. Well so much for establishing a new ritual. I woke up this morning to rain and forecast of rain all day. My miraculous electronic marvel of a camera cannot take rain. I did not get up, get out, and take some photographs, come home, select one, edit it, write it, all in time to leave at 4:30 for a New Year's Day party. Perhaps the ritual will be that I'll say I'm going to do something and then not do it. Here's a photograph from December 2. I hope to be in 2007 tomorrow but I can't promise. Happy New Year, ya'll.